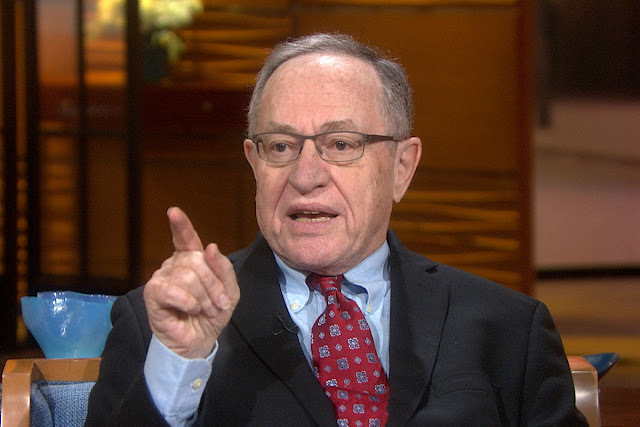 If President Trump adds Alan Dershowitz to his legal team, Special Counsel Robert Mueller is going to have a fight on his hands. Trump invited Dershowitz to dinner on Tuesday at the White House, according to the Daily Mail. Considering what Dersh said earlier, this is unreal. Hope he gives him some grown up advice about Syria. Libertarianism isn’t about shielding the POTUS or any head of state from investigations into past business practices and behavior. And one can be sure super zionist and friend of Netanyahoo Dersh won’t be advising Trump not to attack Syria or reduce US troop levels there. As a libertarian, I object to one part of the state using my tax dollars to investigate another part of the state. If there are anti-Trumpers who want to put their own money where their mouth is, and fund an investigation, they should feel free to do so. Exposing a head of state as corrupt, criminal, and a hypocrite makes it politically weaker. Those tax dollars get spent by the state one way or another; spent this way they can do some good. I don't believe that this type of exposure has any useful impact on statists. Their reaction is typically that we just had the wrong head of state (and everyone's preferred guy or gal is holier than thou); Nixon's impeachment didn't seem to lead to any permanent weakening in the power of the presidency. Moreover, these tax dollars will be spent in addition to, and not instead of, all the other things the state does; when you can print money and/or borrow without limit, there are no (apparent) trade-offs. In the mid 70’s the Church Committer investigated abuses by the CIA, NSA, FBI, IRS. Civil liberties were greater in the Ford/Carter years than they have been ever since. After Watergate the US pulled all its troops from Viet Nam, and there wasn’t a major US military aggression until 1990. In 1977 the Panama Canal treaties were signed, resulting in the eventual full withdraw of all US troops from Panama. By your logic, it’s preferable to have no judicial or legislative branch of government or any check on or oversight of the head of state, because they all require public financing; thus an absolute dictatorship is the best form of government. If you actually believed that you wouldn’t be living in the US. You are describing temporary lulls in the power of the presidency and attacks on civil liberties. My point is that there is no permanent positive change; the nature of the office of the presidency, and of the state itself, is for greater destruction of liberty over time (which you point out). Since 1977 we've had presidents of both parties act aggressively overseas (both overtly and covertly), trample on liberties at home, and oversee a massive expansion in the national security state. Battles among different arms of the state are over who should exercise power over the citizenry, not whether the citizenry should have more liberty (in this, the different arms of the state are in complete agreement). You're almost right on my logic: I also don't believe we should have a head of state. I don't recognize anyone's right to rule over me without my consent, and believe that the "best form of government" is a purely voluntary arrangement. You’re arguing a straw man since I never said anything about “permanent positive change” one way or another. Libertarians usually consider it good in itself to have a weaker “head of state” and more civil liberties, for any length of time. They considered the exposure of Nixon’s corruption and law breaking a good thing; and the same with that of the Reagan administration and Iran/Contra. In your 2nd paragraph, you’re evading the fact it logically follows from your preference that the greater the centralization of power the better: that an absolute dictatorship is the best form of government. That you’re an anarchist is irrelevant. I'm not arguing a straw man. In my second post I made the point about there being no permanent positive changes, and then you responded citing some temporary changes which you alleged were positive. I was simply pointing out that your post wasn't an adequate response to mine. I'm not sure why you think I'm "making up history." Is it your contention that the last 40 years have brought us non-interventionist administrations and an increase in liberty? Finally, I can't follow how my being an anarchist -- that my preference is for no coercive government -- implies I believe an absolute dictatorship is the best form of government.